What’s Your Energy Type & How Does It Affect Your Life? Home » Self Development » What’s Your Energy Type & How Does It Affect Your Life? 1 Which of the 4 Types from the Energy Type Chart below resonates the most with you? Are you living true to your natural movement? 1.2.1 The point is, if your plan for securing your health is based on Western Medicine alone, this list is scary. 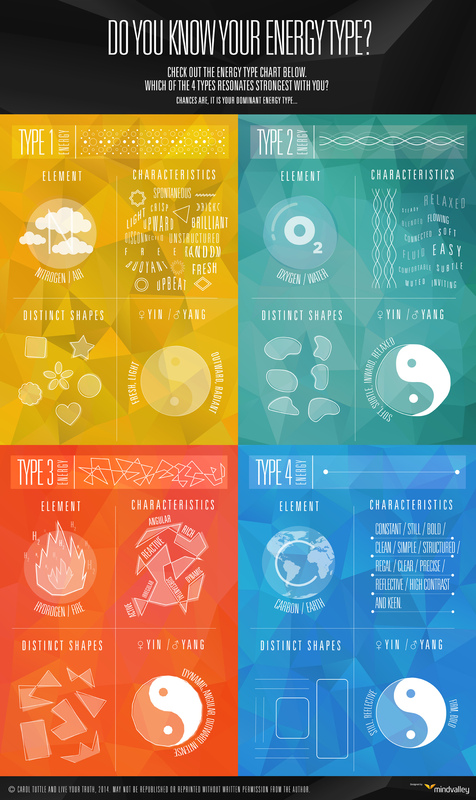 Which of the 4 Types from the Energy Type Chart below resonates the most with you? Are you living true to your natural movement? Having studied personal development for some time, you’ve almost certainly come across the term “energy” and “vibrations” in some shape or form. And as Albert Einstein knew, both you and I are energy, vibrating at various speeds. But it doesn’t mean we’re “just” energy. Healers like Carol Tuttle, who is an expert in energy anatomy, suggest that we are an expression of energy that falls into one of FOUR types. Bright and animated, with a gift for new ideas and possibilities. Soft and calm, with a penchant for gathering details and making plans. Swift and dynamic, with a tendency to get into action quickly to see results. The reason I’m sharing this with you is that you know that everything is energy. But how do you apply this to your life? The cruelest form of starvation is to tie someone up and put a banquet before them, inches out of reach. Health is such a banquet, and for countless people, it is being held out of reach. They’ll do anything to stay healthy; only they don’t know why they can’t. If you’re one of them, this list might hold the clue to the why. 1. An estimated nine million Americans are unnecessarily hospitalized every year. 2. About 750,000 deaths occur in the United States alone as a direct result of poor medical care. 3. Every year, 20 million unnecessary prescriptions are written for antibiotics to treat minor VIRAL infections. The point is, if your plan for securing your health is based on Western Medicine alone, this list is scary. Little wonder that alternative medicine modalities are so hot these days — people are hungry for something new. But one particular field of alternative medicine has seen tremendous growth. It is sneaking its way into hospitals, surgery rooms, medical clinics, insurance companies and even medical schools. Can you guess what it is? Energy Medicine – the science and art of optimizing your energies to help your body and mind function at their best. Do you know that energy healing is one of the world’s oldest personal growth tools ever? Yes, that’s true. If you take a look at ancient eastern cultures, you’ll see a heavy reliance on energy healing. The ancient Indian spiritual tradition, which is over 5,000 years old, speaks of a universal energy called Prana, while the Chinese called it Ch’i. They both believed it to be one of the most potent tools for healing yourself and creating change in life.